“… do not alter the reality of the dream; do not divorce the magic of the story or the vitality of the myth. Do not forget that rivers can exist without water but not without shores. Believe me reality means nothing unless we can verify it in dreams.”- Don Manuel Cordova (Ino Moxo) speaking in Cesar Calvo’s The Three Halves of Ino Moxo. The trip from Quito to Tena takes about six hours and involves going up and down the Andes with snow covered volcanoes hovering above and a landslide one hard rain away on the side. The bus, with Braveheart dubbed in Spanish playing on a flat-screen TV in the front, drives half the time on the wrong side of the road and stops constantly to pick up or let off people. It goes 20 miles an hour uphill and 50 miles per hour downhill with the brakes activating every few seconds to avoid plummeting into the ravine on whichever side happens to be the downside of the mountain. Arriving at Tena, I manage to pick the only taxi driver who doesn’t know where Kuyaloma is. I think it is my Spanish at first but then find he had just moved to Tena from Quito and wasn’t familiar with all the nuances of the area. He goes to ask someone for directions and comes back in a few minutes. Later I discover most of the taxi drivers know Don Luis personally. We drive from Tena to Port Napo, then on a road along the river. After missing the poorly marked turn several times and asking directions, we find a gravel road that leads up to where Don Luis and his family lives. Don Luis is a traditional healer. He is 58 years old, but extremely fit and athletic. He is also kind, gentle, and, I would say, charismatic. 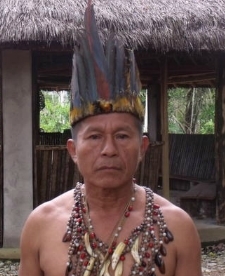 Like most traditional healers of the Upper Amazon he uses ayahausca along with great many other herbs and treatments. His treatment conducted in a ceremony (the term used by Don Luis) is called a cleansing or limpia in Spanish. The accommodations are humble but more than adequate. Visitors sleep in wooden huts built on concrete slabs with shared showers and toilets. There is a kitchen and eating area several dozen yards away. Don Luis and his extended family live just down the hill. Roosters, hens, and chicks chicks roam around the buildings scratching for whatever food they can find. A pack of relatively well-behaved dogs show up whenever food is served. The ceremonies are conducted in a circular thatched structure with wooden half walls surrounding a fireplace built into the concrete floor. Surrounding the fireplace are wooden benches that are covered with pads for participants. A late afternoon rain comes down from the Andes and cools off the afternoon heat. Around eight o’clock, we gather and find our places on the benches. The room is lit by a candle and the fire in the floor. The fragrant smell of burning wood fills the air. With Don Luis are his wife, his son Juan, and his son’s wife as helpers. Don Luis takes off his shirt and puts on a large necklace made of teeth, feathers, and beads. He explains what will happen and asks if there are questions. Don Luis begins by smoking large cigars of a strong, native tobacco. The smoke is blown into the room. He picks up his flute and a robust, almost other worldly, sound comes out. One by one each of us are invited to sit on a small stool in front of him. The ayahausca is poured from a kettle into a small bowl. Don Luis moves it back and forth and blows smoke over it. Each person drains the bowl slowly then rinses. Shortly Don Luis provides a small piece of ginger to chew. Juan blows the candle out and the wood on the fire is rearranged to diminish the flame. Only a large pile of glowing embers illuminates the space of the room. Time passes and not much seems to be happening. I sit wondering how long the ayahausca will stay down. They have provided bowls for the expected throw up. The first thing of significance I notice are the embers in the fire transforming into some sort of bizarre animal – something like a glowing bulldog with misshapen bulging eyes. The visions come on replacing the room and its space with symbols and bizarre shapes in HD color. They change and evolve quickly almost like the spinning symbols of slot machine never coming to rest. Shortly afterward I vomit. I feel only about 2% of my brain has any contact with my body or where I am. Whether my eyes are open or closed (and half the time I don’t know which) my entire field of vision is filled with images that seem to stream like an incomprehensible message being downloaded into my nervous system. I trust that later I will understand the message. Don Luis summons me for the limpia. I need to be helped to walk across the floor. I sit in front of him again. He waves feathers or leaves around me. He has been me take off my shirt and sprays a liquid over my chest and back. He then sprays both sides of my hands and tells me to wipe the liquid on my face. Then he tells me to close my eyes. Suddenly he is somewhere over my head and the images are extremely strong. It is almost like Don Luis is guiding the images, but many of them I do not remember after the experience. He plays music on the flute, harmonica, and what I think is a Jew’s harp. Then he sings. The limpia is over. I go back to my seat and the next participant takes a seat on the stool. Eventually visions start to ease back in intensity. Juan begins giving me lots of water. I begin thinking a lot about my family. I see my older daughter evolving into a young woman having a career and eventually marrying. I see my younger daughter, adopted from Romania, growing in contact with her birth mother and family. I see her holding hands with her mother. My wife and I are left. Everything passes from us. Everything in the world passes. Our friends and relatives die. Our homes are torn down and replaced. Nothing is permanent, but that is the way it is and it is good. The visions start to dissipate. Eventually I go back to the room but I can´t sleep for a long time. I barely sleep two hours but wake up with a lot of energy. Two days later I watch the preparation of the ayahausca. Don Luis prepares ayahausca from plants that he cultivates in a sustainable manner on his property. That night a group of five people from Quito arrive for a ceremony. Don Luis and I both agree to a smaller dose for me. The ceremony is conducted as before. My first visions are of two fishes or snakes swimming in narrow pools in this giant hall like the baths in Budapest. Everything is in brilliant shades of red, yellow, and orange. I walk by myself to the stool for the limpia. Instead of 2% in my body, I am more like 10% in my body with the lower dose. The images from the limpia seem familiar as if the same visions are reoccurring with the same songs as the first night. It is as if I am repeating the visions from the first night because I couldn’t remember them- something like a remedial course. I have a vision of a network of membranes or cells pulsating in a box-like structure. I have the distinct impression I am seeing my lungs or kidneys from the inside. Everything is in yellow or white and the cell walls dark red. The next vision is the most profound. During the cleansing when Don Luis plays the harmonica, the song is very sad. Suddenly I remember I had exactly this same experience with the harmonica the first night and had forgotten it. The song is sad because everything including myself is so limited and will pass. So this song is like a funeral song for me. But the song is making fun of me and my self-pity so it is not simply sad, but ironically sad like the proverbial violins. Everything is in purple with something sliding back and forth to the music with this bizarre pattern in the background. Later I have the impression of Don Luis putting something inside me by blowing into my head. After I return to my seat, a huge thunderstorm brews up outside and serves as a backdrop to the rest of the ceremony. The visions diminish more rapidly with the smaller dose. During the day we compare experiences and discuss with Don Luis. He tells me during the first night the goddess put two rose-colored diamonds in my head. He thinks the snakes in the pools are a good omen from the second night since his instruction came from the lagoon and his practice is based on its wisdom. I tell him about my thought that he put something inside me and he confirms that he put something in me to give me a control that I needed. He doesn’t elaborate about what sort of control it is. My scientific side can’t resist analyzing the visions even as they seem so completely believable to me on their own terms. The scientific approach to non-normal cognition usually is to dismiss it or to reduce it to physiology or neurology. Take this quote from recent article: “Contrary to popular belief, research suggests that there is nothing paranormal about these experiences. Instead, near-death experiences are the manifestation of normal brain function gone awry, during a traumatic, and sometimes harmless, event.” (1) The authors go on to cite oxygen deprivation, release of noradrenaline in the mid-brain, and the brain’s attempt to make sense of unusual sensations and perceptions occurring during a traumatic event as possible causes of paranormal experiences. Michael Persinger has similarly attributed experiences of UFOs and mysterious, sometimes alien, presences weak electromagnetic stimulation of the temporal lobe. He also notes the link between people having religious experience and temporal lobe epilepsy. During the third ceremony, I follow the transition from no effect to effects. For a while after drinking nothing happens, then things start to become distorted and I sense things are changing, then the transition happens in a moment. Pop!. Suddenly the empty space in front of me becomes a room with blue walls, deep shadows, and faces on the walls. The wall connects to a hall that extends off into some seemingly infinite distance as in a Renaissance painting. Don Luis sings and twirls something. I sense energy being projected from him in a spiral throughout the room as if I am seeing the sound of his song. When I shut my eyes cartoon characters prance about. Suddenly a whole room of boats or canoes appears to my right. During the cleansing, Don Luis appears in the darkness like a psychedelic man in a poster from the sixties. Lines and patterns are across his body, jaguar-like. The experience of the cleansing is different this time – no remedial work. When he says to close my eyes, I am inside of something like a pipe or tunnel, with yellow walls in sharp geometric shapes assembled at irregular angles. The walls seem to pulsate and move and they appear to be driven by creatures in the center of each plane. Each is a living creature with human like face and each seems to be owner and protector of its own wall or plane. However, the creatures have bizarre eyes and noses. They live in a world that is like it would be if our world were turned inside out (or maybe it is the reverse – we live in the inside out of their world). After the cleansing, I lie down. I look at the ceiling and can see through it into the sky above. Then I am in a marsh and everywhere I look there are eyes through it observing me. The effects dissipate and I return to my room. Hours pass before sleep comes but again I awake with energy. What have I seen? Where have I been? For the sake of argument, let’s agree to the reductionist arguments. Let’s agree there is a physical or neurological part to the visions. We can even say that is all there is. Can’t the same be said of normal cognition, normal vision, and normal perception? For that matter, what is normal? Hidden inside this reductionist approach is a gigantic but unstated assumption that any experience or cognition associated with supposed abnormal brain function is not valid but experience or cognition associated with supposed normal brain function is valid. The experience is dismissed because it associated with physiology or neurology regarded to be not normal. The problem with this should be obvious particularly to a reductionist. If experience and cognition can be solely explained by physiology and neurology as a reductionist believes, then normal and paranormal experiences are actually on the same footing as to validity. The fact is that everything we perceive really is phantasma. The red of the rose is not real. It is a particular wavelength of light. The sound of the distant thunder is not real. It is an acoustic wave moving through the air. Solid objects don’t really exist. We might kick a large rock and we might hurt our foot but physics says the rock is mostly empty space and the pain in our foot is the product of a nerve impulse. Our experiences are all in the past, delayed by a neurological time-lag and assembled into a coherent whole bearing perhaps no resemblance to what is actually “out there” in the world. The pattern forming process in the brain/mind mimics the pattern forming forces of nature. We are completely cut off from real cognition. We are trapped in our sensory equipment and the cognitive apparatus of our brain. We make sense of the world only because we are a part of it and constructed as it is constructed. We are from the same pattern forming processes that built the world. Small wonder that mathematics seems to work so well to describe scientifically the world since the mathematical knowledge springs from the same source as the world. I prepare to leave and say my good-byes. In the taxi back to Tena from Kuyaloma, the radio plays techno music. On the bus back to Quito from Tena, the Transporter movies are playing. 1- Dean Mobbs and Caroline Watt,”There is nothing paranormal about near-death experiences: how neuroscience can explain seeing bright lights, meeting the dead, or being convinced you are one of them”, published in “Trends in Cognitive Sciences Volume 15, Issue 10, 447-449, 18 August 2011. This entry was posted in Ayahuasca, DMT. Bookmark the permalink. It’s really amazing and interesting. Loved the way u described in. Hi Jim, I found your journey fascinating and well written in depicting every detail of your encounters. Appluad … Having been to two countries in South America, I can certainly understand the culture and environment you experienced. Reading along your essay, I felt like watching the Discovery channel at some point. It is amazing how chemical can do to one’s body. Thanks for taking me to your trip through your essay. Thank you for sharing your beautiful experience. I’m making my way to Ecuador and I would be very thankful if you could give me any guidance on how to contact Don Luise or someone that knows him to ensure that he’s still there. I just want to inform that we are two people traveling from Norway to meet Don Luis Vargas in august 5.-14. So far there are only five people booked for the period, so i hope you too will come join us. To James. Thanks for this wonderful description. I enjoyed it. My Spanish is a little rusty but not so bad. I was in the Peace Corps in Costa Rica many years ago. Luis and Juan speak very little English. Hopefully you will have some one to assist. They will do a good job, however, leading and pointing you to what to do next. They are very attentive to your needs. Click the lodge link at the bottom of the posting for contact information. i am traveling there soon, hope the experience awakens my spirit. I am in Ecuador right now and would like to go find the ayahuasca shaman you visited. Do you maybe have contact details or can you tell me where he lives so I can try to visit him? Go to Tena and ask around. He is well-known in the area and lives a few miles outside the city.